Relaxation. It’s one of the main reasons people see a massage therapist, and it’s one of massage’s most well-known and scientifically proven benefits. But for some people, it can be difficult to relax during a massage. There may be many reasons why your body doesn’t want to get with the relaxation program, but here are a few of the most common reasons. Day-to-Day Stress- Normal work related stress can prevent you from enjoying your massage if you have trouble clearing your mind during your time on the table. And if your mind is preoccupied about some big event that’s looming on the calendar—a deadline, a meeting or travel plans, for instance, it may be hard to release those thoughts in order to relax into your massage. Unfamiliarity- If this is your first massage or your first session with a new therapist, it is natural to have a little nervousness. After all, you are treading into unfamiliar territory with someone you know little about. Don’t be hard on yourself if this sort of nervousness arises for you. Body Image Concerns- Many people worry about exposing what they perceive as physical flaws in the therapeutic setting. Things like varicose veins, unshaven legs, acne, and extra body fat can cause some so much anxiety that they can’t seem to fully relax. If you have body image related concerns, know that you are not alone, and don’t let these worries keep you from enjoying the benefits of massage! If you are one of these clients who just can’t seem to relax during a massage session, here are some tips that may help. Teach yourself a simple breathing exercise to help release stressful thoughts and allow your body and mind to fully relax. Start the breathing exercise the minute you get situated on the table or mat—even before the massage session begins. 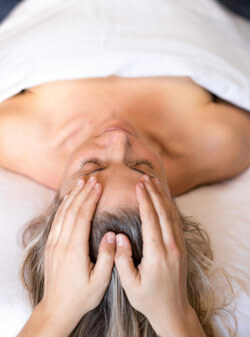 The sooner you clear your mind, the more benefit you will get from your massage. It can be very nice to get a massage during your lunch hour, but it may be easier to relax at the end of the day, so that you don’t have to anticipate going back to work. Instead, you can go home and extend your relaxation time with a bath, a book, or a nice, leisurely walk. If body-image concerns are what is keeping you from relaxing, rest assured that you are not the first body your therapist has seen, nor will you be the last. No body is perfect, but every body deserves respectful, caring touch in the therapeutic environment. Your massage therapist is not judging your flaws or cataloging your physical attributes. He or she is there to help you enjoy greater health and well-being. If you are receiving Thai massage, be sure to wear comfortable clothing. It can be hard to relax in work clothing or jeans. If you are getting a table massage, be sure to have a set of comfortable clothes to change into after your session so that your relaxation can continue after you leave. If undesired thoughts keep popping up during your massage, try repeating a mantra to yourself to refocus your attention on the relaxing, health-giving massage you are receiving. It can be as simple as “I am relaxing”, or you might count to one hundred in your head. Keep your eyes closed. It is the job of our eyes to take note of everything that is going on visually in our environment. During a massage, you don’t want all of that visual data interfering with your experience, so keep your eyes closed to get the full benefit from your massage session. If the temperature in the massage room is too warm or cold for you, it can be hard to relax. If that is the case, don’t be afraid to let your therapist know that you are uncomfortable. Make sure you arrive to your massage appointment having eaten something (but not a heavy meal), and you are adequately hydrated before the session begins. A growling or overfull stomach can make it really hard to relax. Give these suggestions a try! We hope they help you to achieve deeper relaxation and fuller enjoyment of your massage session!